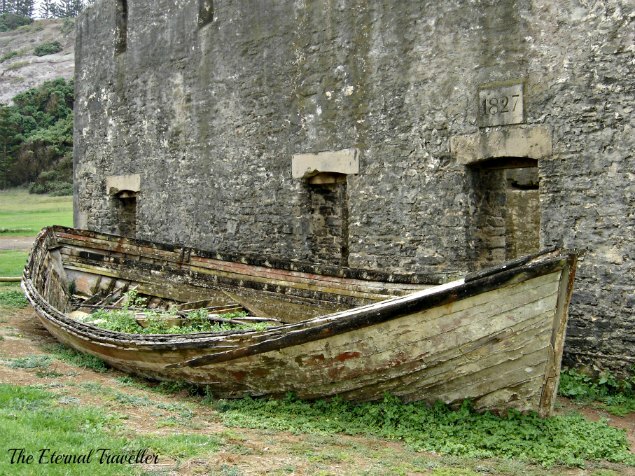 An derelict boat lies next to the ruins of a convict building within the precinct of the Norfolk Island Museum. ← A Loo With A View, Part Two! Very beautiful picture. I could write a story around it! I’d like to read it when you do! You should go there. It is a very beautiful and interesting place. Thanks for following. That truly is an abandoned boat! Not knowing my geography but presuming Norfolk Island is a small island(! ), is it near the sea at all? It’s in the Pacific Ocean, sort of on the same latitude as Sydney and was first a penal colony and then the descendants of the mutiny on the Bounty were resettled there. It is a fascinating place to visit. http://www.norfolkisland.com.au/ It’s an external territory of Australia. It looks a very interesting place with lots to do! That boat must have some history! Thanks. Great photo! I know some folks from Norfolk Is, but haven’t been there myself. I hear it is beautiful and it has such an interesting history! We spent a week there and it was great. We love history and scenery and there was plenty of both, not to mention the duty-free shopping. It’s a very poignant photo. I wonder who the last people to use the boat were? If only it could talk – I reckon that boat would have some amazing stories to tell. I wouldn’t be surprised. It would not have been a pleasant place in the prison days and there are some sad stories. That boat isn’t going anywhere!